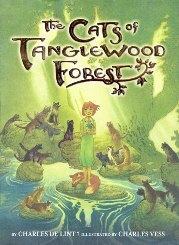 The Cats of Tanglewood Forest by Charles De Lint. Interest Level: Grades 5 and Up. Lillian, out searching for fairies in the woods, is bitten by a venomous snake and she feels her life beginning to slip away. Her friends, the cats of the forest decide to use their most powerful magic to return her to life by transforming her into a kitten. Unhappy in that form, she must convince the old Possum-Witch to transform her back into a girl. Will Lillian learn that she must accept the consequences of her choices? Farm under her wing since her aunt passed away. When she got the snake bite the cats came and saved her by turning her into a cat. Then after she hade great adventures. I really enjoyed this book! I really like this book it’s a great book! I enjoyed reading it. This book is the best because it is a book that starts with a little bit of sadness then it kind of feels like it is going to be happy but it gets sad again.